Outdoor water use accounts for 50-60% of most home water bills. That can add up in a hurry, especially in dry years. One good way to economize is to apply the principles of Water Zone Gardening - grouping plants by their water needs and watering accordingly. This allows you to save water in some areas of the garden (the dry zones) while giving each plant the water it needs to thrive. Our gardening philosophy here at Mother Nature’s Backyard is a practical one: work with what you have. It’s much easier to treat your garden’s characteristics as assets – positive attributes - instead of limitations. Your garden’s physical assets (sun; shade; wind; soil characteristics; etc.) are the canvas on which you paint your garden. Your garden’s assets give your garden its character and shape. They are also what keep our ‘excessive tendencies’’ in line (yes, we all have those tendencies – we’re human, after all)! So, view the need to reduce your garden’s water use in a positive light. Water Zone gardening can re-make your garden into a more interesting and inviting place for your family (and many other creatures) to enjoy. Water Zone gardening involves conscious choices on how to ‘spend’ your water budget. For example, you may choose to spend more water on your vegetable garden or fruit trees and less on your lawn. It also requires you to study and work with the conditions in your yard. Water Zone gardening involves choosing the right plants – and watering methods – for each Water Zone. Water Zone gardening is not difficult, but it does require some thought. We use three basic Water Zones in Mother Nature’s Backyard. Each is slightly different in appearance- each is interesting and beautiful. 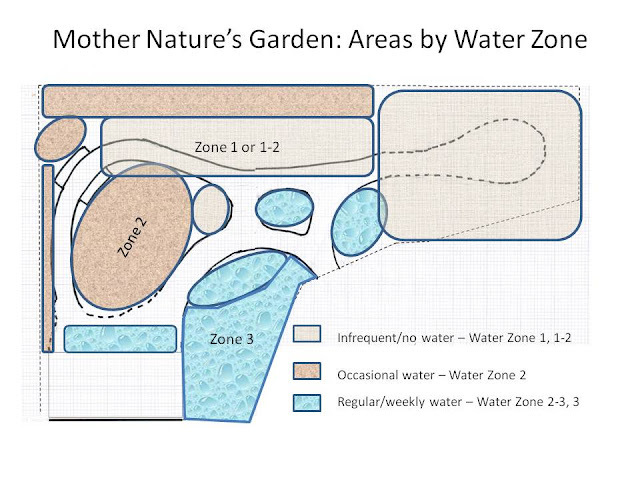 Southern California gardens have three basic Water Zones. You will likely want to use all three in your garden. Description: Most water from rainwater. Many native plants, including shrubs, will be summer-dormant; ornamental grasses turn golden-brown. Annual wildflowers & bulbs disappear. Watering: Plants mostly get by on rainwater; winter irrigation only during prolonged dry spells (4 or more weeks with no rain). Established plants watered only 1-2 times in summer. Suitable plants: Many S. California native plants from western L.A. county (once established) can be treated as Zone 1 or Zone 2 plants. Some examples would include native shrub species like Salvia, Artemisia, Encelia & Eriogonum as well as some large shrubs and trees. Also plants from desert areas. Best watering methods: Easily watered with garden hose; water deeply. Description: Plants receive occasional summer water; winter watering in prolonged dry spells. Plants may be summer-dormant or evergreen. Plants range from perennials to large shrubs & trees. 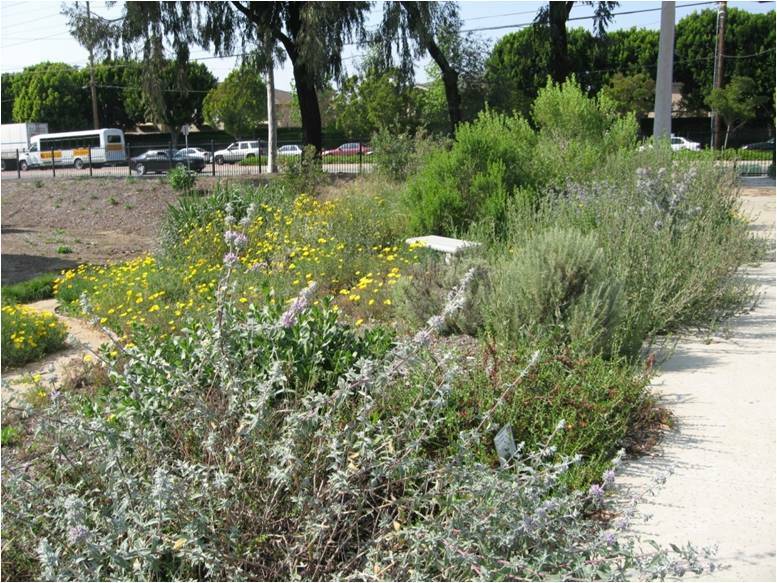 Examples: Water-wise groundcovers/lawns; many water-wise gardens (including butterfly gardens, scent gardens, native plant gardens); established trees and large shrubs (even non-native). Watering: Summer & fall irrigation only when soils are dry at a depth of 4” (dig down to check). Sandy soils often watered 2 times a month in summer/fall; clay soils may only need water once a month. Soils are watered slowly and deeply – may take several hours to water adequately. Suitable plants: Most plants labeled ‘water-wise’ including many California natives (note: will likely need more water during first year or two until plants are established). 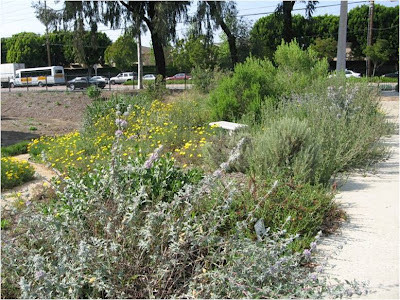 Local native plants (from western L.A. county) are particularly well-suited. Popular native plants from local foothills and the central & northern California coast also do well in Zone 2. Examples would be species of Ceanothus, Manzanita, Baccharis, Ribes and many others. Best watering methods: Water using low-flow sprinklers, soaker hose/soaker tape, micro-sprinklers, drip irrigation or garden hose. Water early morning or late in the day. Description: Regular water; soils are moist/damp year-round. Plants may be evergreen or seasonal. Examples: Sod lawns, rose gardens, vegetable gardens; plants around garden ponds; rain garden plants (if kept wet year-round). Watering: Plants are watered from spring (when soils dry out) to fall (when rains saturate the soil). Suitable plants: many common nursery plants – most will be labeled as needing ‘regular water’. Also native plants from wet places: riparian, wetland and pond/lakeshore plants. Best watering methods: Water with multi-stream rotator sprinklers or shrub heads in the early morning. The key to efficient water use is working with the conditions in your yard. Take a good close look your entire yard. Often the easiest place to start defining Water Zones is with areas that are naturally dry. Are there places that seem to always dry out or are difficult to water? Consider working with Mother Nature by converting these areas to Water Zone 1 or 2. You can plant them with drought tolerant plants and decrease your overall water use. You may even discover areas that could require no water at all. For example, you might convert a difficult-to-water area into a patio, sitting area or utility area. Use bricks set in sand or a gravel mulch as hardscape and you now have an area that needs no water and infiltrates rainwater as well. Do you like/have plants that require regular water? 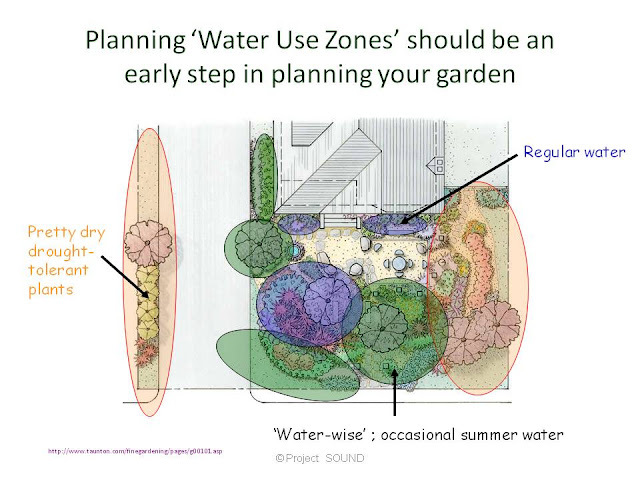 The next easiest areas to define are those that require regular water (Water Zone 3 areas). You may have a rose garden or other special plants that need water. Or you may want to plant a vegetable garden. By grouping plants you’ll be able to provide Zone 3 plants with the water they need in an efficient manner. You can focus intensive watering efforts on these areas – and choose an irrigation system that fits your needs. You might consider planting Zone 3 plants next to a lawn, near a water feature or at the bottom of a slope where they get a little extra water. Learn to work with Mother Nature! Use naturally wet areas of the garden – like shady areas – to your advantage. If possible, you’ll want to locate Zone 3 areas away from Zone 1 areas. The water needs of Zone 1 and 3 plants are very different, so it’s best to separate them by areas of Zone 2 plants or hardscape (non-planted areas). Water Zone 2 is probably the most interesting Water Zone in most gardens. Many exotic, fragrant and beautiful local native plants (from western L.A. county) can be treated as either Zone 1 or Zone 2. In nature, these plants get by on rainwater alone. In the garden, they look better with occasional summer water. Just be sure to let the soil dry out in Zone 2 areas between deep waterings. Many plants from California’s central and northern coast are most comfortable in Water Zone 2 or between Zones 2 and 3 (Zone 2-3). They do well in transition areas between Water Zones 2 and 3. Get to know your plants better. Many nurseries, including native plant nurseries, provide information about water needs for individual plants (read the labels carefully). Consider the water needs of each plant before you purchase it. Visit water-wise and native plant gardens for inspiration and information. Use the Water Zone information on our garden’s plant signs to help you choose plants that are right for your garden. In summary, the trick to saving water is to view your yard as containing several different ‘gardens’, each with its own water requirements. Using Water Zone principles makes this possible. Creating areas that get ‘less than regular’ water allows you to use plants that actually require less water. You can spend your ‘water budget’ on the plants that matter most to your family, save money and create a more interesting garden – all at the same time! Everyone’s asking about the showy, purple-flowered plants in pots near our back porch. It’s no wonder they’re creating such a buzz. 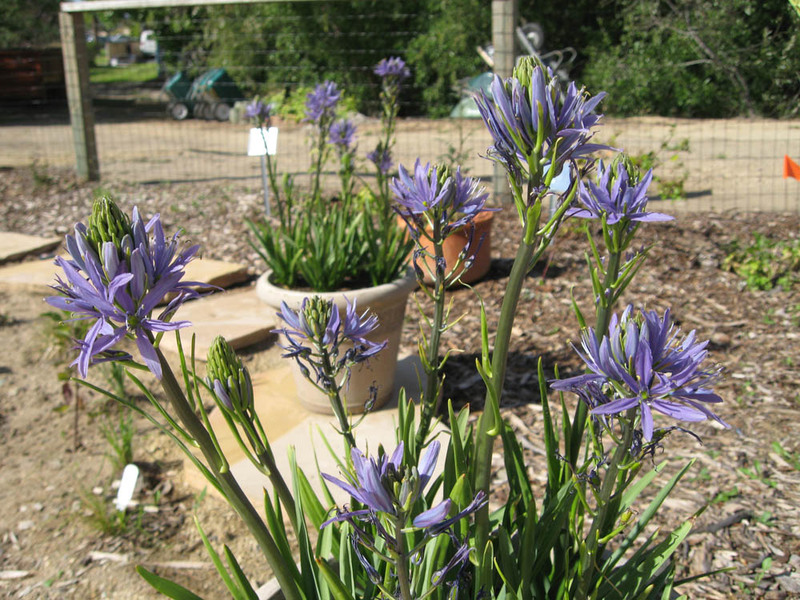 The Giant Camas is one of the loveliest of the California native spring bulbs! And luckily for us, it’s easier to grow than it is to pronounce (by the way, the scientific name is pronounced ‘kah-MASS-ee-ah lekt-LIN-ee-eye subspecies sooks-DORF-ee-eye’). 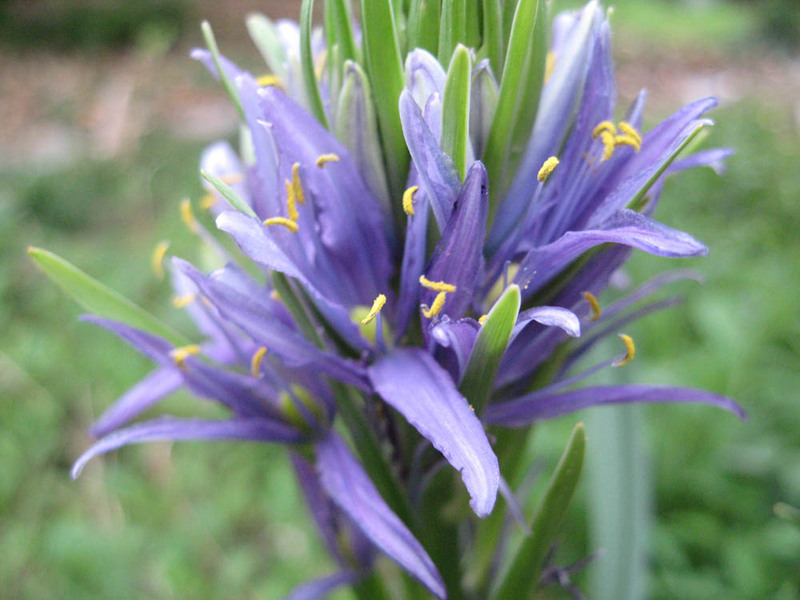 Large Camas is native to meadows from central and northern California to British Columbia, Canada. It belongs to the genus Camassia (the Camas Lillies) and the family Lilliaceae (the Lily family). Like all lilies, Large Camas is a true bulb. 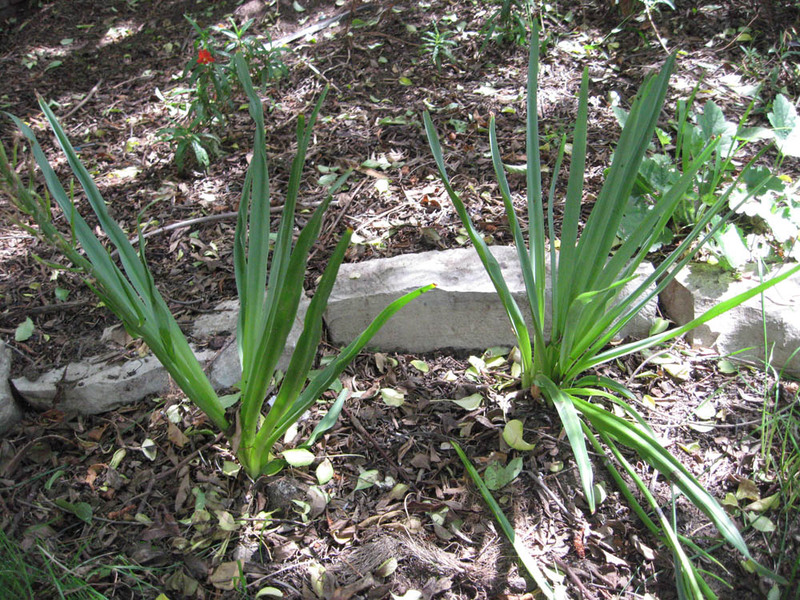 It grows new leaves in late winter/early spring, flowers and then dies back to the bulb. This is just one of many ways that California native plants cope with the long dry summers of our Mediterranean climate. 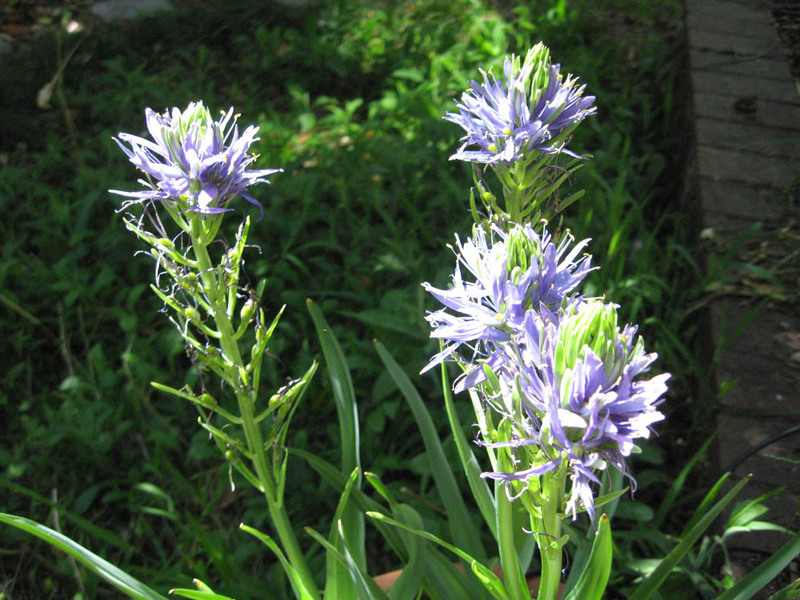 Large Camas has bright green, strap-like leaves that emerge from the bulb in December or January. They grow quickly until March/April, when the flowering stalks begin to emerge. In our area, Large Camas blooms anytime from March to May, depending on the weather with flower stalks growing taller than the foliage. The foliage is about 1 foot tall; mature plants will form a clump 1-3 feet across. The delicate-looking blue-purple flowers grow on a rather sturdy stalk that’s 2-4 feet tall. The flowers open sequentially from the bottom to the top of the stalk, providing blooms over 2-4 weeks. The blooms attract hummingbirds, butterflies and other insect pollinators, making them doubly attractive. 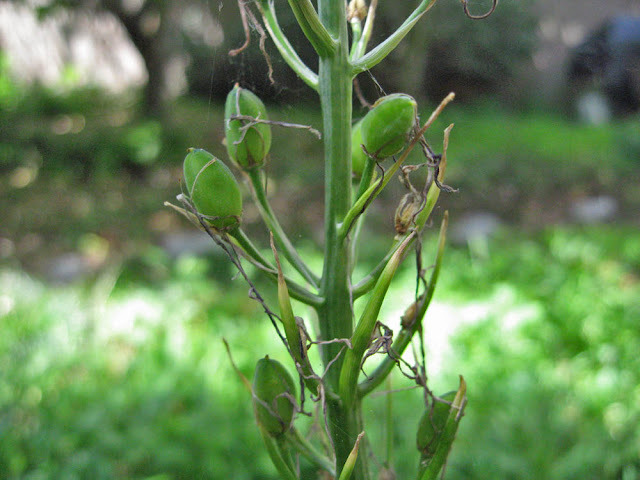 If flowers are pollinated, you will note seed capsules developing along the stalk as the flowers wither. The seeds will take several months to mature – they are ready when the capsules open, releasing the seeds. The seeds will produce new little plants next winter if conditions are right. Large Camas like full sun to part-shade (under tall trees is fine). It is a true meadow plant – it likes to be moist in winter and spring (until the flowering is complete) and then needs to slowly dry out in summer/fall. This pattern is true for most California native bulbs: they need a dry dormant period in summer & fall. So you need to carefully consider where to plant native bulbs in your garden – you can’t grow them just anywhere. 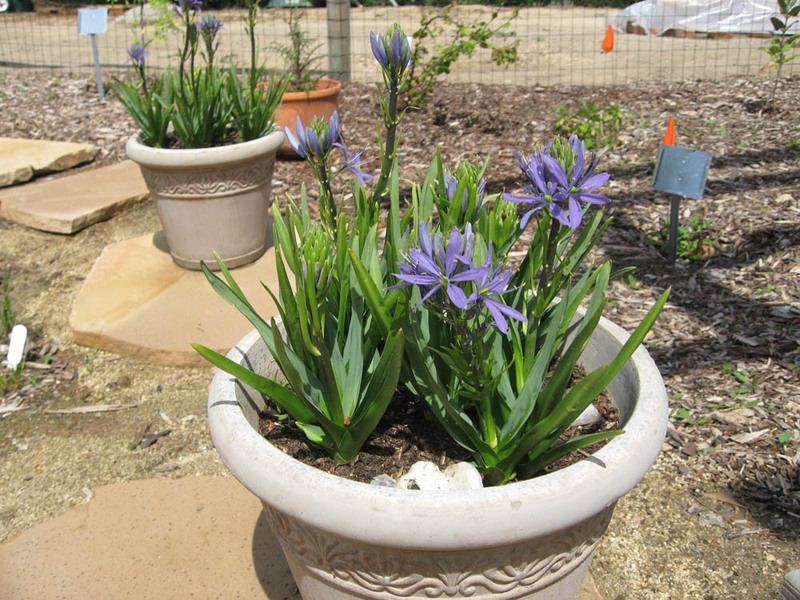 In Mother Nature’s Backyard, we keep our bulbs in pots or in a special ‘bulb garden’ that gets no summer water. Bulbs of Large Camas can be purchased from specialty bulb sources like Telos Rare Bulbs (http://www.telosrarebulbs.com/index.html) or more traditional bulb growers like Brent & Becky’s Bulbs (https://store.brentandbeckysbulbs.com/spring/?us) , Whiteflower Farms (http://www.whiteflowerfarm.com/100409-product.html) , ADR Bulb Growers (http://www.whiteflowerfarm.com/100409-product.html) and van Engelen Bulbs (http://vanengelen.com/catview.cgi?_fn=Product&_category=Best:Camassia) . The bulbs look like the picture below. They are large for native bulbs. 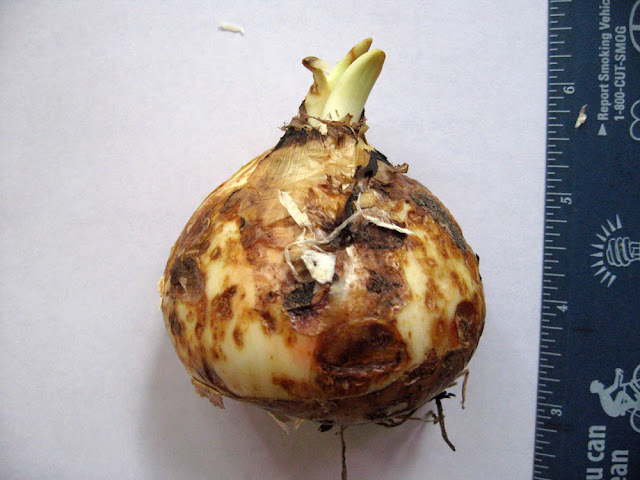 Plant your bulbs in the fall, at a depth of 3 times the height of the bulb. California native bulbs do well in most local soils, from sandy to clay, as long as they are summer dry. If you are planting in a pot, choose one that’s at least 1 ft tall by 1 ft. wide and has a drainage hole. Once the winter rains come, be sure that the soil doesn’t dry out until the flowering has ceased. That’s really all there is to growing Large Camas. California native bulbs like Large Camas make wonderful additions to the home garden. You can use them in pots, in dry beds and borders or other dry spots in the garden. Native Californians bake the bulbs and eat them like a sweet-potato. The flower stalks make nice cut flowers. And they also make your garden a welcome sight for hummingbirds and butterflies.